Many of us Filipinos -who had lived for 2 generations or so -have repeatedly heard and read the claim that after WW2 we Filipinos and/or our homeland were second only to Japan. I believed so; though I think we were actually referring to the more urban areas at the time, in particular Manila, where most national government offices, public services, light industries, higher education, banking and commerce were located; while most of the countryside and islands, were mainly devoted to agriculture, if not idle lands, many of which were/are privately owned by absentee hacienderos. Sionil Jose talks about why we were left behind by our erstwhile more backward and poorer Asian neighbors. He mentions that our damaged culture. He speaks of elitism, which we can say is essentially that of an aristocratic-socioeconomic elite, of the foreign and/or mestizo elite, who also comprise the so-called educated elite, who looked up to their foreign masters (the Spaniards then, the Americans later) and looked down on the native Filipino masses/common tao. We still have these mestizo elite, throw the Spanish-Chinese, American or other foreign hybrid. To these elites, we can throw in the nouveau riche, many "who got it made" through thievery from odious debts and government revenues, beginning with the Marcos Dictatorship and its successive regimes, all seeing the government coffers as their source of personal wealth formation. The OCW-OFW remittances have been extremely useful to the ruling regimes and their support systems (the military, technocrats,cronies etc.). These remittances serve at least dual purposes: to provide a bigger government pot to steal from and simultaneously create a social safety-relief valve to a potentially explosive situation if the educated, politically unconnected masses were kept within the homeland without decent livelihood/employment. The regimes dupe and sweeten OCWs/OFWs by calling them "heroes." Sionil Jose puts our supposed avoidance of manual labor as part of the Spanish heritage. To this I can only add that he must be referring to the members/descendants of this elite and those who are wannabe-elites. He demonstrates his elitist self when he charges that we Filipinos are lazy. I have lived long enough to appreciate and learn that we native Filipinos are not lazy, whether one is educated or not. Of course, just like with any nationality or race, there are lazy individuals. I find Sionil Jose deficient in understanding, if not quite ignorant, of what poverty is all about. Does he understand the fact that many of these people, while growing up, are much more likely than non-poor children to suffer developmental delay and damage, to drop out of school, and for the poor girls to give birth during their teen years? Does he understand the fact that poverty is caused by interrelated factors: parental employment status and earnings, family structure and parental education? Does he understand the fact that an individual brings with him the hidden rules of the class (i.e. impoverished) in which he was raised -patterns of thought, social interaction, cognitive strategies, etc. which may/may not help him leave his state of poverty? Sure we know that one can get out of poverty through education and relationships. We know some reasons to leave poverty: it is too painful to stay, a vision or goal, a key relationship or a special talent or skill. We have seen these all happen by individual effort but it would be much better and the opportunities wider if the government -whose main job is to provide human progress to its citizens- performs its main job. Sionil Jose blames our inward-looking nationalism with regards to industrialization then, now mostly gone thanks to IMF/WB imposed removal of tariff and exchange control, with consequent devaluation and uncontrolled profit repatriation by foreign companies, the cheap buy-out of our domestic companies, now worsened by the WTO rules and agreements signed by our technocrats without the knowledge and understanding of the populace. I wonder what he was referring to. Until the Marcos Dictatorship, our industries were mostly classified as light-manufacturing, chemical, food, textile, assembly and a few others. I have worked for several years in a chemical company owned by a native Filipino family and it was a technologically progressive, professional and treats its employees better than its competitors. Sure, it used the BOI-classified "preferred industries" to gain some tax incentives. Thus it ventured to new chemical manufacturing to satisfy local and export markets. What's wrong with looking out for our own when a serious study of how the developed nations became such was precisely to their decades long, inward-looking nationalism for a start and competing/looking out only when strong enough. and even to the present, such advance nations still do inward-looking practices, i.e. protectionism in certain industries and sectors of agricultural production while they demand absolute free-trade from the poorer countries like ours. Sionil Jose may be correct if referring to say,our sugar industry which was essentially owned and operated by the aristocratic-oligarchs who were conspicuously living it up with inefficiency since they were guaranteed for a long time to export under the American quota system with a higher than world market price (thanks to Cuba turning communist) while exploiting their workers and sacadas under slavish conditions. While I was in SMC-Corporate Planning I wrote a sugar industry analysis which indicated how badly this industry was - like milking a cow to death or using a machine to obsolescence. Any nationalist program for industrialization should be to produce necessities first, to satisfy the domestic market first, to make use of best available technology, if possible to make use of domestic substitutes as raw materials, etc.. Of course the reversal to the traditional, narrow nationalism exploited by the aristocratic elite (or any new elite) shall not be allowed under a truly nationalist leadership.. An actively nationalist government control and participation, if necessary, shall be applied. Obviously such a program can materialize only when the prerequisite, significant portion of native Filipinos have developed into true Filipino nationalists, into decolonized Filipinos, as Renato Constantino wrote about it. This active and courageous nationalism is a sine-qua-non for the leaders and citizenry, given that the forces behind globalization will exert forms of pressure. i.e. media, economic isolation and even military blockade/force, to equate nationalism with "communism" as they have done so in the past, to have it their way. As to Claro M. Recto and Lorenzo Tanada, they may have been against agrarian reform in their earlier years, but both realized in their later years that land reform is an imperative to nationalist industrial development of the homeland, i.e. Prof. Constantino wrote of "The Making of a Filipino" about the ilustrado Recto. For Tanada, his change is greatly indicated by being a founder of BAYAN, a nationalistic coalition movement that calls for agrarian reform among others. Sionil Jose said we did not implement land reform and mentioned land reform in Japan and Taiwan. He did not define who "we" is. Did he forget or not know that in Japan it was the Americans, specifically Gen. Douglas MacArthur who imposed land reform (the same Douglas MacArthur we Filipinos with naïve sentimentality remember and look up to like a demigod)? Did he forget or not know why the Americans never implemented land reform in our homeland while they were still the colonizers? As for Taiwan, then General/President Chiang-Kai-Shek, a nationalistic strongman/dictator, was driven and aided by America to implemented land reform and pursued heavy industrialization. I add that the two countries at the time profited from the Cold War, i.e. Communism versus Capitalism. America wanted to showcase both Japan and Taiwan versus Communist China. Furthermore, the active roles of their respective, although dictatorial, governments to educate the populace for nationalism was instrumental in consolidating them (nationalism was already in existence in Japan at the turn of the 20th century; nationalism was pursued by the Chiang's Kuomintang Party on their displacing the local Taiwanese). I do not read fiction and so have not read any of Sionil Jose's famous fictional stories, though I have read one of his social commentaries. I find him always criticizing the Spaniards but not the Americans as former colonizers. I get a feeling he has friends in the States and have noted that he has been receiving accolades and awards from American literary societies for his writings. He does not bite the hands that feed him. So I have some understanding where he is coming from. 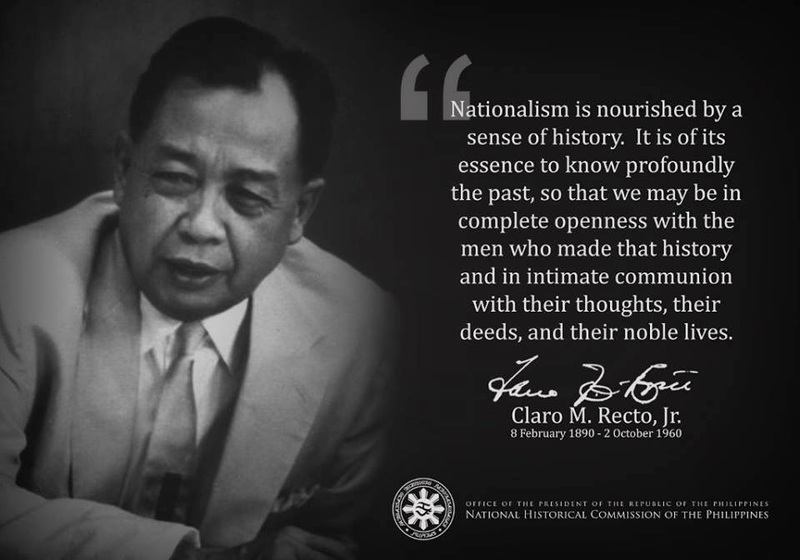 Re education for change, education for Filipino nationalism is imperative. Not just plain education for a career or profession, to help repair our damaged culture; a nationwide nationalist education is possible but may be improbable without going through a period of a bloody nationalist revolution, which many of us, who profit from (or want to be part of) the status quo, are fighting against its happening now with our colonized minds and JUSMAG/American-trained military. Below is F. Sionil Jose's article. What did South Korea look like after the Korean War in 1953? Battered, poor, but look at Korea now. In the Fifties, the traffic in Taipei was composed of bicycles and Army trucks, the streets flanked by tile-roofed low buildings. Jakarta was a giant village and Kuala Lumpur a small village surrounded by jungle and rubber plantations. Bangkok was crisscrossed with canals, the tallest structure was the Wat Arun, the Temple of the Sun, and it dominated the city's skyline. Rice fields all the way from Don Muang Airport - then a huddle of galvanized iron-roofed bodegas, to the Victory monument. Visit these cities today and weep - for they are more beautiful, cleaner and prosperous than Manila. In the Fifties and Sixties we were the most envied country in Southeast Asia. Remember further that when Indonesia got its independence in 1949, it had only 114 university graduates compared to the hundreds of Ph.D.'s which were already in our universities. Why then were we left behind? The economic explanation is simple. We did not produce cheaper and better products. The basic question really is: why we did not modernize fast enough and thereby doomed our people to poverty. This is the harsh truth about us today. Just consider these: some 15 years ago a survey showed that half of all grade school pupils dropped out after grade 5 because they had no money to continue schooling. Thousands of young adults today are therefore unable to find jobs. Our natural resources have been ravaged and they are not renewable. Our tremendous population increase eats up all of our economic gains. There is hunger in this country now; our poorest eat only once a day. But this physical poverty is really not as serious as the greater poverty that afflicts us and this is the poverty of the spirit. Why then are we poor? More than ten years ago, James Fallows, editor of the Atlantic Monthly came to the Philippines and wrote about our “damaged culture” which, he asserted, impeded our development. Many disagreed with him but I do find a great deal of truth in his analysis. This is not to say that I blame our social and moral malaise on colonialism alone. But we did inherit from Spain a social system and an elite that, on purpose, exploited the masses. Then, too, in the Iberian peninsula, to work with one's hands is frowned upon and we inherited that vice as well. Colonialism by foreigners may no longer be what it was, but we are now a colony of our own elite. We are poor because we are poor - this is not a tautology. The culture of poverty is self-perpetuating. We are poor because our people are lazy. I pass by a slum area every morning - dozens of adults do nothing but idle, gossip and drink. We do not save. Look at the Japanese and how they save in spite of the fact that the interest given them by their banks is so little. They work very hard too. We are great show-offs. Look at our women, how overdressed, over-coiffed they are, and Imelda epitomizes that extravagance. Look at our men, their manicured nails, their personal jewelry, their diamond rings. Yabang - that is what we are, and all that money expended on status symbols, on yabang. How much better if it were channeled into production! We are poor because our nationalism is inward looking. Under its guise we protect inefficient industries and monopolies. We did not pursue agrarian reform like Japan and Taiwan. It is not so much the development of the rural sector, making it productive and a good market as well. Agrarian reform releases the energies of the landlords who, before the reform, merely waited for the harvest. They become entrepreneurs, the harbingers of change. Our nationalist icons like Claro M. Recto and Lorenzo Tañada opposed agrarian reform, the single most important factor that would have altered the rural areas and lifted the peasant from poverty. Both of them were merely anti-American. And finally, we are poor because we have lost our ethical moorings. We condone cronyism and corruption and we don't ostracize or punish the crooks in our midst. Both cronyism and corruption are wasteful but we allow their practice because our loyalty is to family or friend, not to the larger good. We can tackle our poverty in two very distinct ways. The first choice: a nationalist revolution, a continuation of the revolution in 1896. But even before we can use violence to change inequities in our society, we must first have a profound change in our way of thinking, in our culture. My regret about EDSA is that change would have been possible then with a minimum of bloodshed. In fact, a revolution may not be bloody at all if something like EDSA would present itself again, or a dictator unlike Marcos. The second is through education, perhaps a longer and more complex process. The only problem is that it may take so long and by the time conditions have changed, we may be back where we were, caught up with this tremendous population explosion which the Catholic Church exacerbates in its conformity with doctrinal purity. We are faced with a growing compulsion to violence, but even if the communist won, they will rule as badly because they will be hostage to the same obstructions in our culture, the barkada and the vaulting egos that sundered the revolution in 1896, the Huk revolt in 1949-53. To repeat, neither education nor revolution can succeed if we do not internalize new attitudes, new ways of thinking. Let us go back to basics and remember those American slogans: A Ford in every garage. A chicken in every pot. Money is like fertilizer: to do any good it must be spread around. Some Filipinos, taunted wherever they are, are ashamed to admit they are Filipinos. I have, myself, been embarrassed explain for instance why Imelda, her children and the Marcos cronies are back, and in positions of power? Are there redeeming features in our country that we can be proud of? Of course, lots of them. When people say for instance that our corruption will never be banished, just remember that Arsenio Lacson as mayor of Manila and Ramon Magsaysay as President brought a clean government. We do not have the classical arts that brought Hinduism and Buddhism to continental and archipelago Southeast Asia, but our artists have now ranged the world, showing what we have done with Western art forms, enriched without own ethnic traditions. Our professionals, not just our domestics, are all over, showing how an accomplished people we are! Look at our history. We were the first in Asia to rise against Western colonialism, the first to establish a republic. Recall the Battle of Tirad Pass and glory in the heroism of Gregorio Del Pilar and the 48 Filipinos who died but stopped the Texas Rangers from capturing the President of that First Republic. Its equivalent in ancient history is the Battle of Thermopylae where the Spartans and their king Leonidas died to a man, defending the pass against the invading Persians. Rizal - what nation on earth has produced a man like him? At 35, he was a novelist, a poet, an anthropologist, a sculptor, a medical doctor, a teacher and martyr. We are now 80 million and in another two decades we will pass the 100 million mark. Eighty million - that is a mass market in any language, a mass market that should absorb our increased production in goods and services - a mass market which any entrepreneur can hope exploit, like the proverbial oil for the lamps of China. Japan was only 70 million when it had confidence enough and the wherewithal to challenge the United States and almost won. It is the same confidence that enabled Japan to flourish from the rubble of defeat in World War II.